Sixers star Joel Embiid eats spicy hot wings over a discussion about his relationship with fans in Philadelphia. For the first time in ages, Sixers fans can feel proud of the team's progress during the NBA offseason. The Bryan Colangelo saga was painful and embarrassing, but most would agree the outcome is for the best. While Rookie of the Year Ben Simmons is busy moving in with Kendall Jenner out in Los Angeles, big man Joel Embiid has been spotted all over Philadelphia and the Caribbean throwing dunks down on innocent bystanders. 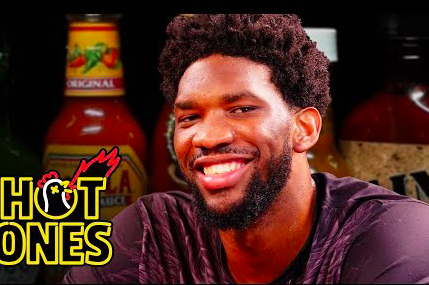 Embiid recently joined the First We Feast "Hot Ones" series to partake in an extended interview while pretending he's not dying through his climb up the Scoville scale. What's up with the savage dunks, Joel? "A lot of times, I'm kind of tempted because, as I'm leaving the tennis court when I'm done, some guys will come and talk trash, talk about, 'oh I can dunk on you,' 'I can cross you up,' or 'I can score on you,'" Embiid said. "And usually, a lot of people like to disrespect NBA players, and I don't like that, you know?" No one would talk trash on Embiid if they didn't know he could take it, considering the way he dishes it. Getting posterized by Joel Embiid is an honor. "The Process is everything," Embiid says of his relationship with Philadelphia fans. "The Process is life."